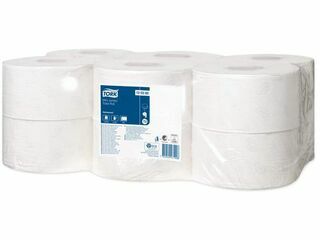 The Tork' Mini-Jumbo Toilet Roll system is big on toilet tissue with over 400 meters per roll, but compact in size. It's the most economical product in the Tork range and also conveniently fits into the Tork Mini Jumbo Toilet Tissue Dispenser. 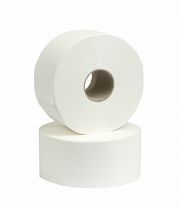 The Tork T2 Mini Jumbo toilet roll reduces the risk of run out and also reduces maintenance costs. Guaranteed environmentally responsible purchasing. Awarded the EU Ecolabel and Nordic Ecolabel accreditation. 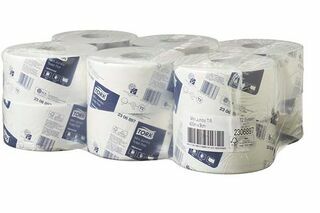 Tork T2 toilet tissue has been awarded the Environmental Choice independent licence: licence No. 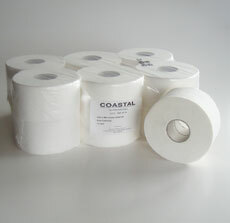 1302011 in Sanitary Paper Products. 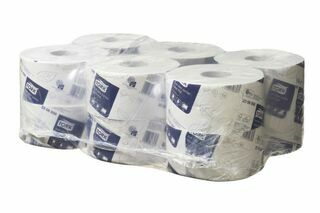 Gracefield mini jumbo toilet rolls, 2ply.